Difference between revisions of "Mole Shopper"
Along with its unique gameplay the scheme is notable for its weapons' power settings, which are set to very high values for most or all of them. Mole bombs in particular are considerably more powerful than usual, capable of creating a large enough cavity when they explode that crates can land within them - making them essential for gaining early access to weapons. This variation requires the "shot-doesn't end-turn" and an increased crate rate, features of [[RubberWorm]]. Players can shoot multiple times per turn, which increases the pace of the game. In the Mole Shopper scheme, players must use their digging tools to burrow through the landscape and collect their weapons from crates. 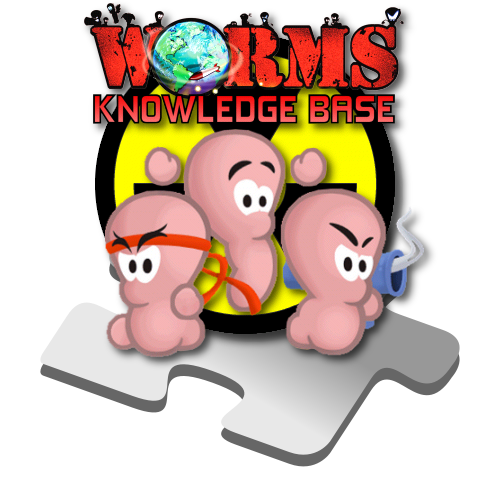 It is played on a solid block of land, in which randomly-placed holes are generated to accommodate the worms and a few barrels. As with most 'shopping' schemes, players start the game with a very limited choice of weapons and tools - in this case with mole bombs playing a central role. With just a few digging and transport tools at players' disposal, only crates can provide the weapons they need to win the game, but the restrictive map forces them to appear only in the spaces which players create by excavating the terrain. A player can manipulate the probabilities to his advantage, digging large caves to 'attract' crates to where he can collect them. Although crates will not appear on the top (or surface) of the map, players can walk their worms along it, allowing them much greater access to the map's lucrative crate-rich caves beneath, and giving them a vantage point from which attacks can be more easily and more effectively conducted. Access to the surface also gives players a stronger position to prepare for and survive the moderate flooding which occurs after only 5 minutes of game time. These advantages make the surface a much sought-after territory, and experienced players will fight bitterly to gain a monopoly of control over it. The race to create and gain access to crate-rich caves while working towards a controlling presence on the surface, all in the context of a looming flood, makes for a tense and highly territorial game, in which forward planning is crucial for ultimate success.